A Prophet has been garnering some major buzz and it’s not difficult to see why. I almost avoided this one because of its length (yes, I got antsy sometimes) and an expectation of serious violence (no, it wasn’t that bad). 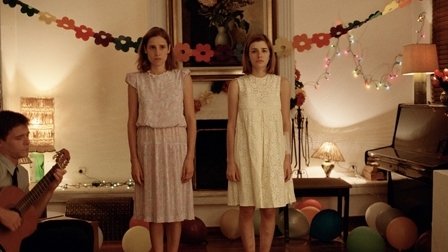 In fact, I found the matter-of-fact, unstylized violence in Dogtooth was much more jarring, even though A Prophet has a significantly higher body count. The rise of Malik is obviously accomplished through no small amount of bloodshed. He’s eventually got his nose in everyone’s business — the gypsies, the Italians, the Corsicans, the Arabs, etc — and watching Malik juggle all these groups is a tense cinematic delight. Not to mention his own personal transformation from dumb juvenile delinquent to powerful criminal mastermind in just 6 years. Unlike Dogtooth, A Prophet has a relatively simple narrative arc and mostly uncomplicated plotlines — which is what perhaps makes it a “genre piece” — but its razor-sharp eye on the protagonist is what elevates the film. Accumulated detail over 2.5 hours makes the powerful last 3 minutes unsurprising in content, but surprising in effect. The crowd tonight loudly applauded as credits rolled; had the director been present, there would’ve been a standing ovation for sure. First off, this film deserves major props for winning me over despite some technical obstacles. I Killed My Mother takes place in Quebec, so it’s in French — but the B.F.F. also had on French subtitles. Below the screen was a PowerPoint giving both English & Thai subtitles, so it was all very distracting, especially for such a dialogue-heavy movie. Not to mention that it was sometimes out-of-focus and our reels appeared to be a little worn. So it took me a little while to warm up to I Killed My Mother — the painfully-real arguments yelled back-and-forth between mother and son are not immediately endearing, either. Yet you quickly discover that Hubert and his mother genuinely love each other, but have no idea how to live together anymore. The film’s 20-year-old (!) director drew from his own experiences growing up (he supposedly wrote the screenplay when he was 17) and the emotional authenticity is what drives this movie. I Killed My Mother goes nowhere really (there’s no actual matricide), which might be maddening for some but was revelatory for me. Among many profoundly beautiful scenes, I found a dream/fantasy sequence particularly inspired — even as I mused about what a field-day Freud would have with this material. I’m quite willing to overlook the film’s flaws because of Dolan’s overall ability to make the viewer ache for mother & son. Though not a documentary, it reminded me of Dear Zachary since both are, in their own ways, desperate attempts to domesticate wild, complicated feelings. For its crazed blitz through teenage rage and the angry side of love, I Killed My Mother received two rounds of applause from the crowd tonight (one during the movie after a particularly excellent monologue, and one as the credits rolled). I was extremely pleased with all three choices, especially since they each had very satisfying endings. All three have been garnering critical hype so I wasn’t that surprised — from here on out I think I’ve signed myself for slightly more untested films (still not wholly sure which films I’m headed to this week). Stay tuned for even more pretentious blogging in the days to come.